If you are needing an economy, entry level trailer eConoBody Trailers are for you! Econobody is Country Blacksmith's house brand of entry level utility, flatbed and cargo trailers. The utility and cargo trailer industry are full of manufacturers that cut a lot of structural corners to make an economy cargo trailer. 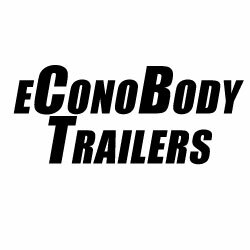 Econobody gives you an economy price with must have features on cargo trailers like 16" wall post centers (not 24" on center), tube wall structure (not Z-posts), 3/8" plywood wall (not 1/4" luan), tube frames (not C-channel) and more. Our Econobody utility and flatbed trailers use structural channel and angle for the frames, LED lights, treated floors, DOT required lights, and more! Rely on our experience to bring you an inexpensive trailer that will last!